沙捞越叻沙是来自沙捞越（有点讲废话哦!）它是用laksa paste, sambal belacan, 鸡骨, 虾壳和椰浆所做的汤底. 配料有米粉，芽菜，鸡丝肉，蛋条, 鲜虾，香菜所组成. 家乡出名了一些美食，比如：哥罗面，laksa，kueh chap 等等。我们家的Laksa不像西马的Curry laksa 或 Assam laksa. 我嘛！好奇怪的，在家乡时，都不怎么爱吃. 可能因为不常回家，所以渐渐的爱上这些食物. Prepare 10 bowls of water and cook with chicken frames and few pieces of chicken breast in a stock pot. Take out the chicken breast and shredded, put aside. Peel off the prawn shells and pan fried till dry and fragrant. Added the cooked prawn shells in the stock pot to enhance extra flavour and boil. Add 2 packets of the Laksa paste (300gm) to the chicken stock and boil on medium heat for 1-2 hours. Filter and discard solids. Prepare 2 canned of coconut milks and pour into the stock pot and boil. Adjust seasoning: salt, a little belacan (shrimp paste) and oyster sauce. Mix half tablespoon of sugar with the off-shelled prawns. This is to have a crunchy texture after you boil the prawn. Soak the bee hoon and cook till softened. Put aside. Boil the prawn till cooked. Do not over-cooked. Put aside. Prepare the omelette and julienne it. Put aside. Finally put some softened bee hoon (rice vermicelli) and ladle laksa gravy into each bowl. 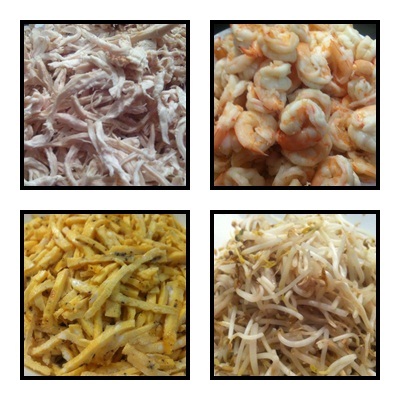 Garnish with shredded chicken breast, cooked prawns, julienne omelette and bean sprouts. Serve hot. Top with mince coriander leaves. Serve with fresh lime and belacan.